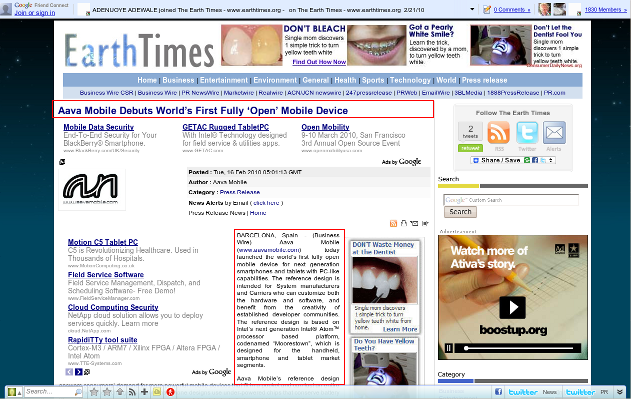 I visited a site linked from Slashdot today, which was an article (press release) about a new “open” mobile phone. The thing that amazed me was the small percentage of the initially-visible browser window devoted to actual useful content. 9.08%, by my calculations. And I have a 1280×1024 screen. So I hereby inaugurate the 2010 “Content? What’s That?” Awards. Find a website page with as small a percentage of the page devoted to content as possible, post a screenshot on your blog with the content highlighted in red, as above, and the percentage calculated, and link to it here. Lowest percentage wins. Page must actually have some content – those typo-squatted all-ads domains don’t count. Analysis is made on the first visible page section only. Yes, people have different display sizes. In case of dispute, I’ll make a final judgement on my display. Please post screenshots stripped of browser chrome. You may also want to shrink them 50%. Headlines count as content. Metadata, intra-site links and ads do not. Whitespace does not count as content. Exception: whitespace within content, e.g. paragraph breaks and space were a headline would go if it were longer, do count. Yes, almost no website would ever score 100%.That’s OK.
530×163 = 11.0% is a logo that isn’t the logo of the blog. Depending on how you count, this is either 17.2% or 2.9% content. Anonymous: fair point :-) I’ll try and get something done about that. Let me nominate http://www.golem.de/1002/73366.html. Not gonna do the math and artwork just now, though. On that Mozilla blog, I’d have counted the line with the date and keywords as part of the content. Sure, it’s metadata, but it’s metadata about a specific blog post, so I’d count it as part of the blog content, in much the same way that a headline counts. Similarly, the attribution note (“posted by [username]”) should count as well. But yeah, the stuff at the top is clearly larger than it needs to be. I’d like to nominate Yahoo. Now, granted, a search box doesn’t take up a whole page. It’s not much larger on Google (which fills most of the rest of the page with whitespace). Nonetheless, Yahoo’s home page has become so crowded with advertising and intrasite links that at first glance it doesn’t appear to *have* any content, since the search box is shoved way up into the banner like it would be on a site where it’s not an important feature. It didn’t used to be like that, but ever since Google took over the top slot Yahoo has sort of lost its way. At this point they seem determined to make themselves irrelevant. The trouble with this nomination is that it’s difficult to draw the line between their content and their intrasite links. For instance, the news headlines link to articles, so they’re intrasite links, but you *can* also just read the headlines on the main page, if you are so inclined. So arguably those should count as content. My estimate comes to about 17%, which is pretty lousy for such a major site.